While support for fully electronic vehicles is growing over time, there are plenty of people who are either afraid of the idea, or simply don’t want to drive around vehicles that rely solely on electricity. After all they are a bit less practical than many gasoline or diesel powered vehicles at the moment. Many people are really excited about the Tesla Model 3 because it will make owning a reliable electric vehicle more affordable, but for those who aren’t the 2017 Jaguar XE presents a surprisingly enticing alternative. The XE is the smallest vehicle that the Jaguar is currently working on and it promises to be both affordable (relatively speaking for a luxury car) and efficient. This little car will be equipped with a 2.0 liter turbodiesel engine that’s capable of achieving fuel efficiency levels in the high 30’s or low 40’s. This is something that most people can get excited about, and the car doesn’t force anyone to move over to the unchartered territories of electric cars. 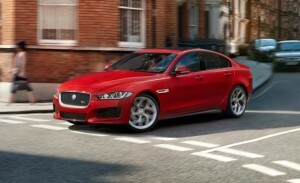 The 2017 Jaguar XE is going to be very luxurious and sporty looking and will come with most of the features and comforts that are expected in a luxury car, but will still be pretty affordable and very efficient. One area where Jaguar vehicles tend to shine is with their handling capabilities. Jags are very responsive and fun to drive, and the XE is no different according to early reviews completed by Car and Driver. The reviewer states that the XE possess “the reflexes and grace that are conspicuously absent in the competition” or the other small sports cars on the market. Not only will the little XE be a great little car to drive from an efficiency perspective and thanks to its looks, but it will be a blast to drive as well. One of the main ways that the XE is going to be able to achieve such impressive efficiency numbers while maintaining a good level of power is through a lightweight aluminum body. It will be one of the few cars out on the road that rely on an almost fully-aluminum structure for the body. Sure it will rely on steel for things like the door, and strength enhancing accents around the vehicle, but by and large it will be made of aluminum and that means a much lower body weight overall than similar sized steel vehicles. All these features make the XE a great competitor for the Tesla Model 3 and it should attract all the buyers who aren’t ready to move over to electric technology yet. Diesel still represents a cleaner alternative than gasoline, especially with biodiesels on the market, but it’s much more familiar than electric cars and packaged so nicely that it’s going to be hard to pass up by many buyers looking for a compact sports car to cruise around in.